Nearly a third of adults in the U.S. get at least some of their news from Facebook, according to a Pew Research Center study. Social media is here to stay and it is prudent for public works agencies to consider using it to connect with their customers. Facebook, Twitter, Instagram, and YouTube are some of the social media channels that can be used to successfully connect and share information with the public. When used to augment the more traditional public information methods, social media can be one of the fastest and most efficient ways to provide information to the public. “In the past, utility companies have provided important information through scripted press releases. Traditional public information channels are still important, but utility companies should also build a social media presence on which they can communicate in dynamic, effective, and personal ways. It’s no longer sufficient to just ‘push’ information to the public. Information needs to become part of an ongoing conversation with the consumer, and social media is a perfect channel for that,” says Daron Selvig, AE2S communications specialist. One of the greatest benefits of going social is the ability to immediately share information on your own terms rather than waiting for traditional media outlets to broadcast your message. In fact, many savvy reporters follow businesses, utilities, and local government on social media because it’s such a convenient way to receive information and news tips. “Social media has moved beyond the point of being an afterthought or a luxury for maintaining good relations with customers and the public. It has evolved into a mainstream channel of communication,” says Selvig. 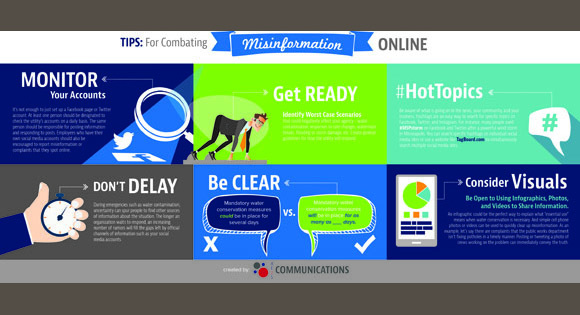 Unfortunately, rumors and misinformation can spread just as quickly as legitimate news. Just a few tweets or shares can kick the rumor mill into high gear, which can snowball into calls and emails from concerned citizens. 1. Monitor Your Accounts: It’s not enough to just set up a Facebook page or Twitter account. At least one person should be designated to check the utility’s accounts on a daily basis. The same person should be responsible for posting information and responding to posts. Employees who have their own social media accounts should also be encouraged to report misinformation or complaints that they spot online. 2. Get Ready: Identify worst case scenarios that could negatively affect your agency--water contamination, responses to rate changes, watermain breaks, flooding or storm damage, etc. Create general guidelines for how the utility will respond. 3. #HotTopics: Be aware of what is going on in the news, your community, and your business. Hashtags are an easy way to search for specific topics on Facebook, Twitter, and Instagram. For instance, after an oil spill in Glendive, MT, many people used #OilSpill in their Facebook posts and tweets. Flood fighters in Fargo, ND, have shared photos and information about flood conditions with #FargoFlood. Similarly, #MSPstorm was used after a powerful wind storm in Minneapolis. You can search specific hashtags on individual social media sites or use a website like TagBoard.com to simultaneously search multiple social media sites. 4. Don’t Delay: During emergencies such as water contamination, uncertainty can spur people to find other sources of information about the situation. The longer an organization waits to respond, an increasing number of rumors will fill the gaps left by official channels of information such as your social media accounts. 5. Be Clear: Instead of saying: “Mandatory water conservation measures could be in place for several days”; it’s better to say: “Mandatory water conservation measures will be in place for as many as ___ days. Until further notice, please limit water usage to essential use only.” The second message conveys a timeframe that customers can expect to be impacted along with specific instructions. 6. Consider Visuals: Be open to using infographics, photos, and videos to share information. An infographic could be the perfect way to explain what “essential use” means when water conservation is necessary. And simple cell phone photos or videos can be used to quickly clear up misinformation. As an example, let’s say there are complaints that the public works department isn’t fixing potholes in a timely manner. Posting or tweeting a photo of crews working on the problem can immediately convey the truth. In addition to providing emergency information, social media should also be used to share lighter information. Examples include the utility’s holiday schedule, photos from around the city, responses to common questions, and even celebrating utility employees’ work anniversaries. When used regularly, a utility’s social media accounts can become a trusted source of information for the public. To let customers know that you’ve gone social, be sure to include links to your accounts on your website, as well as in mailings with a reminder to like or follow the utility on Facebook, Twitter, etc.